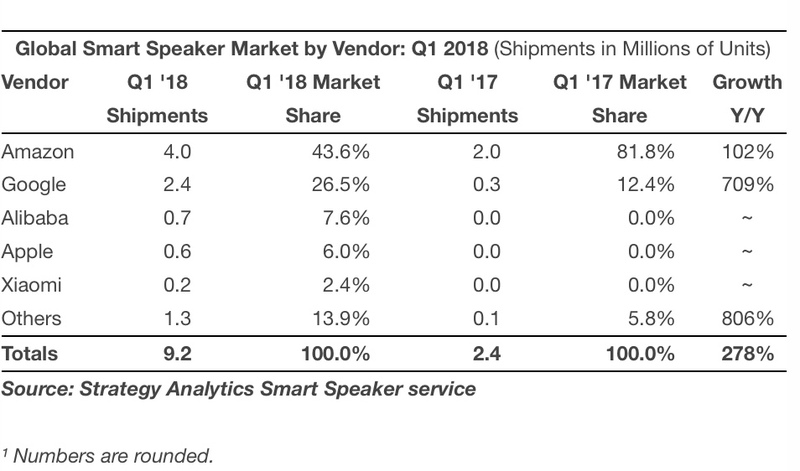 According to the latest quarterly research from Strategy Analytics, global smart speaker shipments reached 9.2 million units in the first quarter (Q1) of 2018. The research group says Apple shipped about 600,000 HomePods to garner 6% of the market. That’s well below market leader Amazon, which is estimated to have shipped four million smart speakers during the quarter though its global market share has nearly halved from the same period last year. Google and Alibaba consolidated their number two and three rankings with sales of 2.4 million and 700,000 worldwide, according to Strategy Analytics. Note that HomePod wasn't available for the all of quarter one as it rolled out on Feb. 9. Also, it’s average selling price ($349) is considerably higher than that of its competitors.